Felice believes that passion is infectious and she showers our members with her commitment to our members and our community. 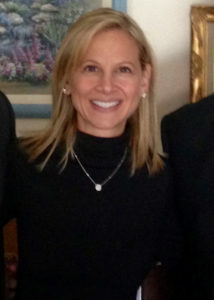 With 11 years of service to Junior League, JLPB couldn’t be happier that she transferred from New York Junior League. In New York, Felice served as the Co-Chair at the Family Advancement and Well-Being committee and the Done in a Day On Demand Committee. At JLPB, Felice has served as Vice-President of Community, Co-Chaired the Done in a Day Committee twice, and Placement Advisor. The League is proud of the accomplishment Felice had in creating and cementing the relationship between the JLPB and the DeGeorge Boys & Girls Club. She holds a Bachelor’s Degree from the University of California, San Diego and a Juris Doctor Degree from the University of Hastings, College of the Law.